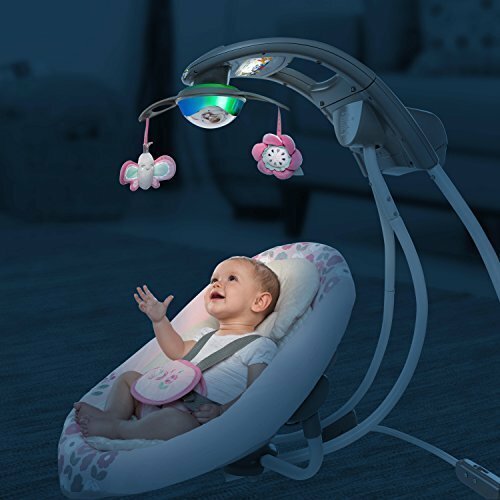 The LightBeams electronic mobile keeps baby happy with moving lights and plush toys. This innovative swing rotates 180 degrees so baby is always in view, and can swing in 2 directions. There are 2 recline positions to choose from, plus a deluxe over-sized seat with a removable head support to keep baby secure and comfortable. An AC adaptor means big savings on batteries. Choose from 8 melodies and 3 nature sounds, along with 6 different swing speeds and 3 timer settings. 5-point harness and easy to clean seat pad. Swing timer offers 3 settings: 30, 45, and 60 minutes.